Core Fusion is a trademarked workout by Exhale, which also offers yoga classes (Venice location only) and boasts a full spa. Core Fusion is, as its name suggests, a fusion of several practices including yoga, pilates and ballet. Class attendees are led through a series of exercises that incorporate light hand weights, stretching leg work at the ballet bar, and a variety of abdominal moves all meant to develop long, lean muscles, and avoid the bulk brought on by intense weight training. The atmosphere is peaceful and zen-like, and you will leave feeling refreshed and energized. 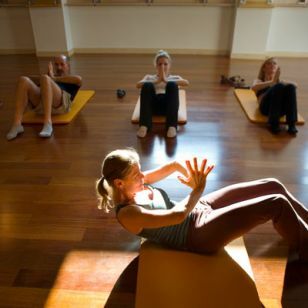 Core Fusion classes are offered at Exhale’s Santa Monica location only (located inside the Fairmont Miramar Hotel). The Venice location (on Main Street) features yoga classes which we have yet to try. Check back for updates soon! Normally, yoga-esque workouts are not my thing. I prefer fast-paced classes, however, I love Core Fusion because I get an amazing stretch and my legs and abs are incredibly sore the next day…always a plus for me! The plie squats at the bar are great for toning your leg muscles and the abdominal work is even better because you’re not just doing every day sit-ups…you’re really working deep into your core without putting any pressure on your lower back. 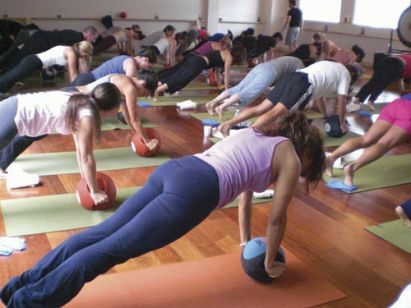 Core Fusion also offers classes to target certain “problem areas” like in their Thighs and Glutes class! If you’re lucky enough to get instructor Elise Gulan, you will be guaranteed and fantastic and challenging workout. She is, in my opinion, the best! Since this class offers such a wonderful balance of so many different exercises, I try to incorporate it into my workout schedule once a week. Core Fusion emphasizes using your own body weight to get in shape. The class is a continuous flow of ballet and pilates, with a slight twist of yoga. Much of the class is done against the wall using the ballet bar. Throughout the hour long workout, your core is engaged the whole time, trust me, you will feel it the next day! The class also reinforces the importance of both posture and breath. I love this class and always leave with my legs shaking and my abs on fire!